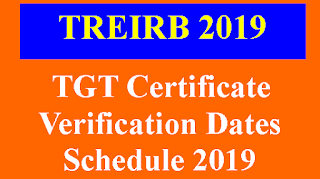 TREIRB Released Schedule For Certificate Verification of TGT (Trained Graduate Teacher) Gurukulam/Residential on their official site.TGT Certificate Verification will be held from 18-02-2019 to 26-02-2019. 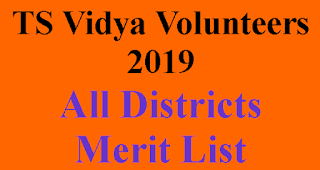 And also Given Attestation Form and check list for Certificate verification. TGT 1:2 provisional selection list also available on their official site. 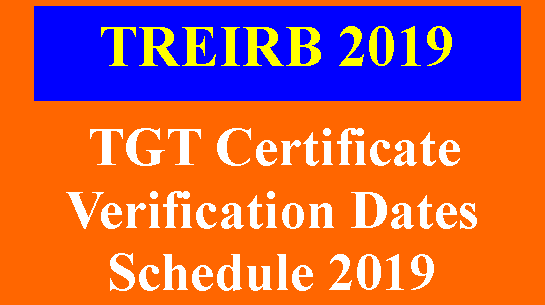 Download TREIRB Residential TGT(Trained Graduate Teacher) Certificate Verification Schedule/Dates And 1:2 Selection List From Below Links. TELANGANA RESIDENTIAL EDUCATIONAL INSTITUTIONS RECRUITMENT BOARD. Provisional dates for Original Certificate Verification of applicants in the Ratio of 1:2 for PGT Posts under Notification No. 01/2018. 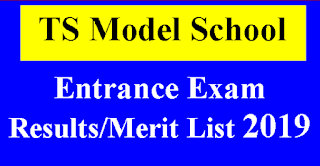 The Hall-Ticket Nos would be displayed for candidates called for certificate verification week prior to the date of verification.